OTTAWA, Ont. 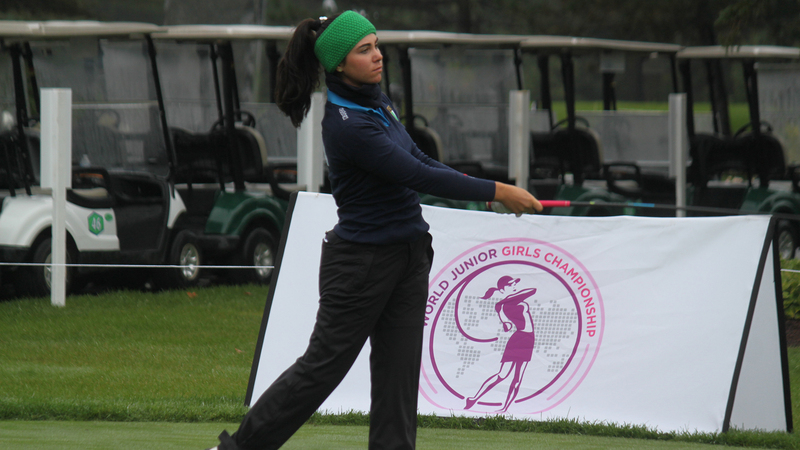 — Under misty skies at Camelot Golf & Country Club in Ottawa, Italy’s Alessia Nobilio was off to the races in the first round, rifling a 6-under 66 to seize the lead in the 2018 World Junior Girls Championship. Nobilio, who currently sits No. 22 in the World Amateur Golf Rankings, took advantage of the windless conditions and went bogey free on Tuesday, notching six birdies along the way. She led the charge for Italy as they registered an aggregate score of 139, to sit one back of first round co-leaders Thailand and the United States. “This is my third World Juniors, I’ve been here (Canada) three times now. I shot minus 6 today, so it was a very good round. My best ever was minus seven at the European Junior Championships this year,” said the 17-year-old from Milan. In the team competition, the United States, propelled by solid outings from Brooke Seay (-4) and Zoe Campos (-2), sit in the lead at 6 under in a tie with Thailand. The Thai team followed their leader Atthaya Thitikul, who fired a 68 in the opening round to sit T2 with Seay in the individual competition. Campos is tied for 4th with Cecilie Nielsen from Denmark and another Thai, Kultida Pramphun, who are all at 2 under. Canada One, featuring Céleste Dao of Notre-Dame Ile Perrot, Qué., Ellie Szeryk of London, Ont. and Tiffany Kong from Vancouver, B.C., share 6th place with Sweden at 2 over par. Emily Zhu (Richmond Hill, Ont. ), Sarah Beqaj (Toronto, Ont.) and Lauren Kim (Surrey, B.C.) who make up Canada Two, trail behind at 15 over par in 18th place. Kong and Dao were the low scorers for Canada at 1 over par. Team Canada is looking for its first medal since capturing bronze at the first ever World Junior Girls in 2014. The World Junior Girls Championship is conducted by Golf Canada in partnership with Golf Ontario and supported by the R&A and the International Golf Federation. Recognized as an ‘A’ ranked event by the World Amateur Golf Rankings, the World Junior Girls Championship is in its fifth edition.